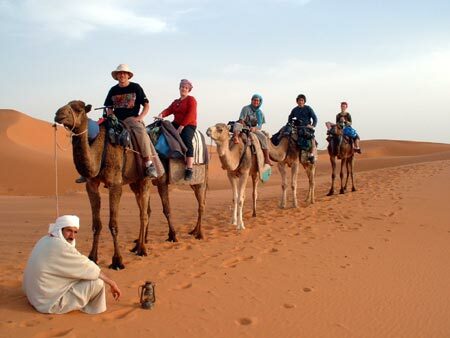 Enjoy desert trip to Merzouga - Erg-Chebbi - in very popular camel trekking tour. You will ride camel to desert camp where we stay overnight in tents. Our trek starts from a hotel in Merzouga near the sand dunes.We ride camels for about 90 minutes , adn we enjoy beautiful scenery. Once we reach desert camp, we watch amazing desert sunset. You will have Moroccan traditional dinner , and we listen to Berber drum music songs. 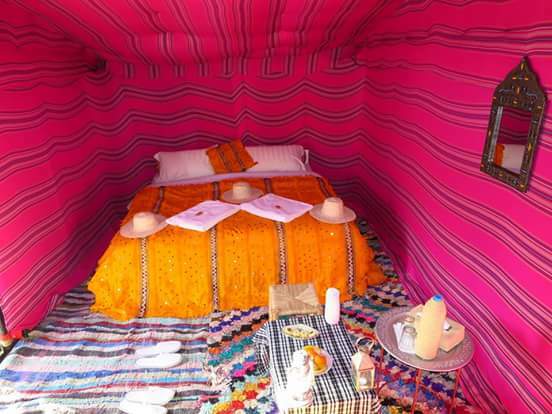 We stay overnight in desert tents of Merzouga. In the following morning our Merzouga camel guide will wake us up to watch the desert sunrise in Sahara. Then we ride the camels back to the hotel. After breakfast and shower our camel ride overnight trip finishes. Camel ride start from your hotel in Merzouga and we departure at around 6 pm , we return back at 7 am in the morning. 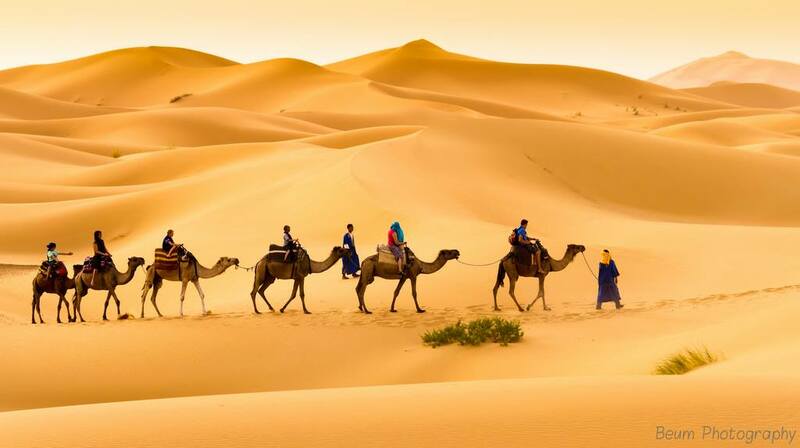 Today we explore Merzouga desert in 2 nights camel trekking tour. We ride camels to the Sahara camp.This Merzouga trek starts from a hotel in Merzouga and we ride camels for about 1 hour and half to reach desert camp. We watch desert sunset before having dinner near campfire. You listen to a Berber drum music. We stay overnight in desert tents. On the next day we visit Nomad people ,visit Khamlia village famous for Gnawa music. We explroe Hassilabiad Nomad museum and we stay overnight in desert camp. In the next morning your Merzouga desert guide will wake us up to watch desert sunrise followed by camel ride back to the hotel. After breakfast our 2 nights camel ride trip finishes. Camel ride start from your hotel in Merzouga and we departure at around 6 pm , we return back at 7 am .